Solar water heating, also commonly called solar hot water or solar thermal, is the solar technology used to heat water using thermal energy. Instead of producing electricity, such as solar electric, solar hot water systems transfer thermal energy to preheat the water in your water tank. As a result, you don’t need to use as much gas or electricity to heat up your hot water and you reduce your utility bills and save money. Oregonians typically spend 20 to 30 percent of their energy dollars to heat water. A solar water-heating system should reduce that by 50 percent or more. During the summer, your existing system may not even turn on. Solar water heating systems collect solar energy from the sun to preheat water so that your gas or electric heater – whether a conventional tank or tankless – does less work. Will it Work on Your Property? 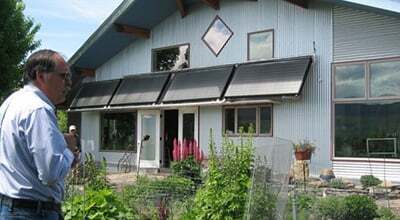 Not every home or building receives enough solar resource to make installing a solar water heating system profitable. Learn more about tax credits and incentives, and typical costs for installing solar water heating.